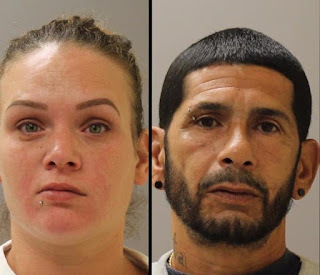 MAYS LANDING- Following a month and a half long investigation by detectives from the Atlantic County Prosecutor’s Office and the Galloway Township Police Department, a township couple was arrested Friday and charged in connection to the aggravated assault and endangering the welfare of their toddler daughter. Friday morning detectives from the Atlantic County Prosecutor’s Office Special Victims Unit and the Galloway Township Police Department arrested Yolanda Torres, 33 and Jose Velez, 52. Torres was charged with second degree Aggravated Assault and two counts of second degree Endangering the Welfare of a Child. Velez was charged with two counts of second degree Endangering the Welfare of a Child. Upon his arrest, Velez was found to be in possession of Xanax pills and was also charged with Possession of a Controlled Dangerous Substance and possession with the Intent to Distribute a Controlled Dangerous Substance. The State alleges Torres committed an aggravated assault on her two-year-old daughter on July 10. No medical attention was sought for the child until she had a series of seizures. The child has been out of Torres and Velez’ custody since the time of the incident. Chief Assistant Prosecutor John Flammer is prosecuting the case.